Scottish Championship title winner Robbie Neilson joins three Premiership rivals on the shortlist for the PFA Scotland manager of the year award. 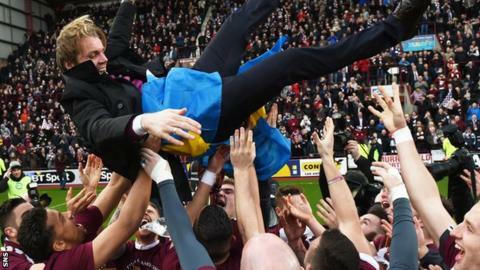 Neilson's Hearts side dominated the division in his first season as head coach and won the trophy on 22 March. Celtic's Ronny Deila, Inverness Caledonian Thistle's John Hughes and Aberdeen's Derek McInnes are the others in contention. McInnes won in 2014 and this year's recipient will be announced on 3 May. Celtic have already lifted the Scottish League Cup under Deila, who took over after leaving Stromsgodset last summer, and the Norwegian's side also lead the Premiership by eight points with four games remaining. McInnes' Aberdeen are second, securing their first runners-up spot for 21 years, and could still win the title themselves, although that would require an unlikely late collapse from the reigning champions. Hughes' Inverness side are third, could qualify for Europe for the first time and have reached the Scottish Cup final, having beaten Celtic in the semi-final. Neilson's Hearts already have amassed a record points tally for the Championship before their final game of the season against Rangers on Saturday. Gordon Strachan, who revealed the list of nominations, praised all four managers up for the award, while also suggesting Queen of the South's James Fowler and Ross County manager Jim Mcintyre were unlucky not to make the shortlist too. "John's fantastic, he's always got a smile on his face," said Strachan. "His natural love for the game comes over. "Ronny's done a job he's been asked to do - to win the league and win trophies. He's done that. "Ann Budge, Craig Levein and Robbie Neilson have been fantastic, they've given the club a real shake. They should be really pleased with themselves with their performances. "Everybopdy in Aberdeen can be pelased with their performance this season, they were near to their maximum all the time and that's all you can ask of the players."